After spending 3 days in Bangkok, it was time to go to the beach. 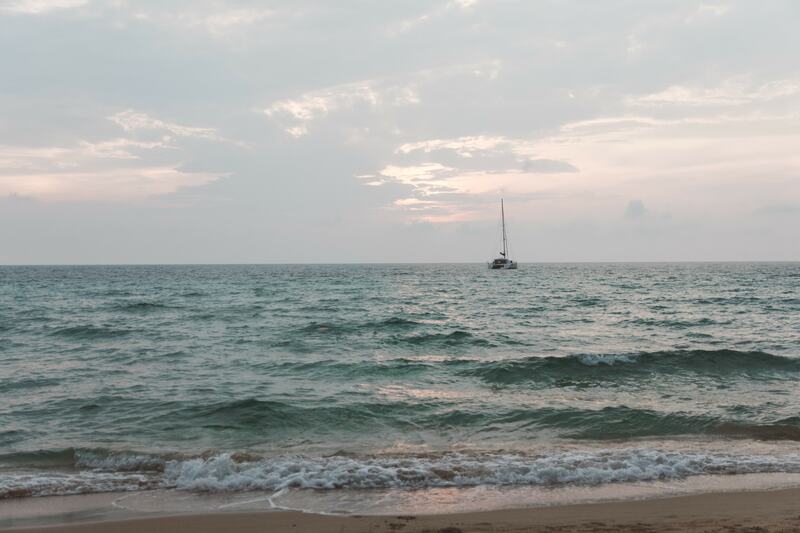 This time we were visiting a new Island in Thailand for us: Koh Chang. 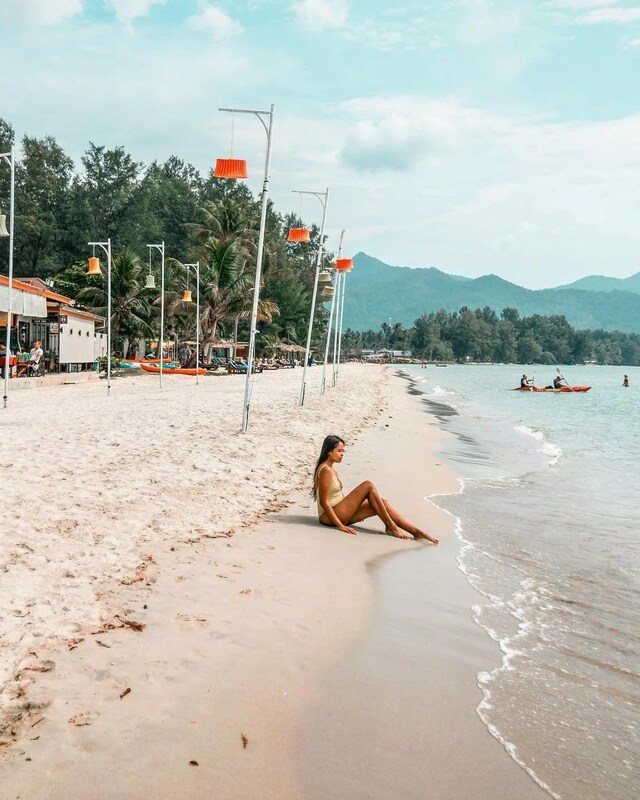 The island of Koh Chang is located in Trat Province which isn´t very far from Bangkok and it´s not that touristic as Koh Tao, Koh Samui and Koh Pangan. 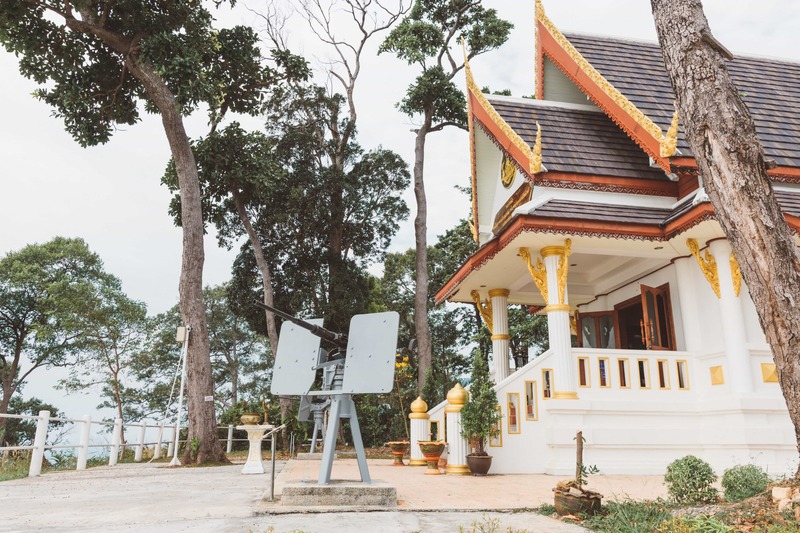 But we will show that there are many cool things to do in Koh Chang in our Koh Chang travel guide where you will know how to get to Koh Chang and our favorite places in the island! 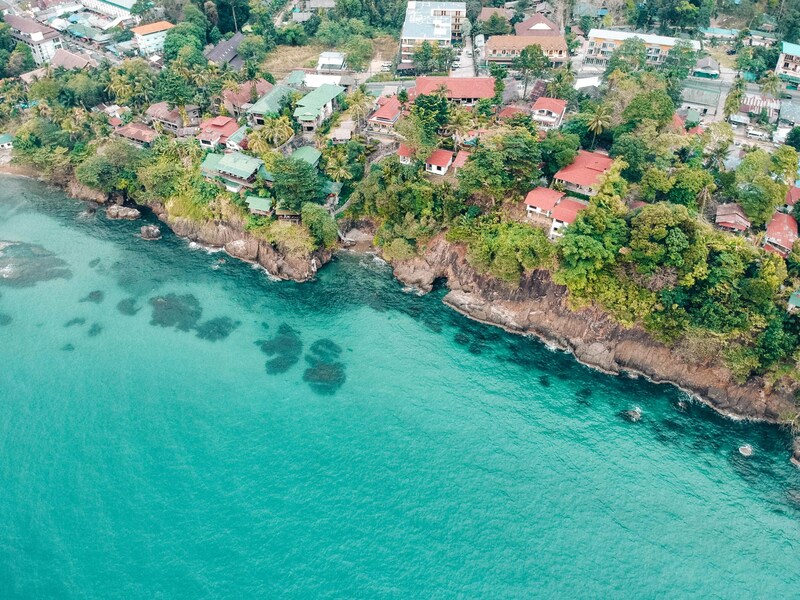 There are a few options to get to Koh Chang. First, you can get a flight from Suvarnabhumi, Bangkok to Trat Aiport in Koh Chang. For our trip, we decided to take a bus from Khao San Road to Koh Chang. Everything was included in the package. We paid 550 Baht each (around $18 USD). We chose this option because it was the fastest and most comfortable for us. The bus journey lasted 5 hours up to the ferry. It took 30 minutes driving a shared taxi to get to the ferry. The ferry ride lasted 45 minutes to get to Koh Chang. Once you get to Koh Chang, you can ride a shared taxi again to your hotel or inn. Prices of the share taxi are between 50-100 Baht. We arrived at White Sand Beach which was around 5-6 kilometers from the pier and paid 50 Baht each. Well, the driver started asking us to pay 100 Baht each but from the hotel, they advised to me that it was just 50. So I just told him that and that was what we paid. In touristic places in Thailand you need to be careful, if not they might overcharge you. Well ist isn´t a big amount of money anyway. 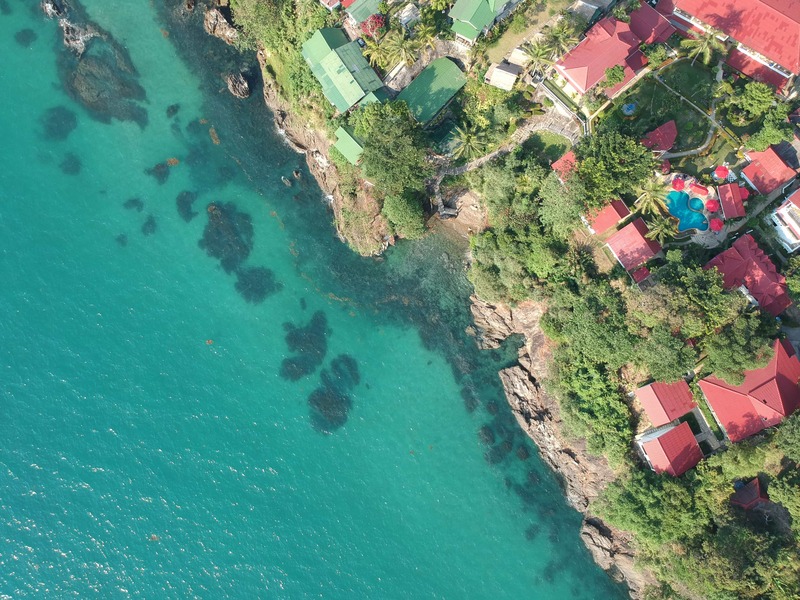 While Koh Chang is a seaside destination that you might be tempted to visit in the summer, we’ve got an even better recommendation for you. 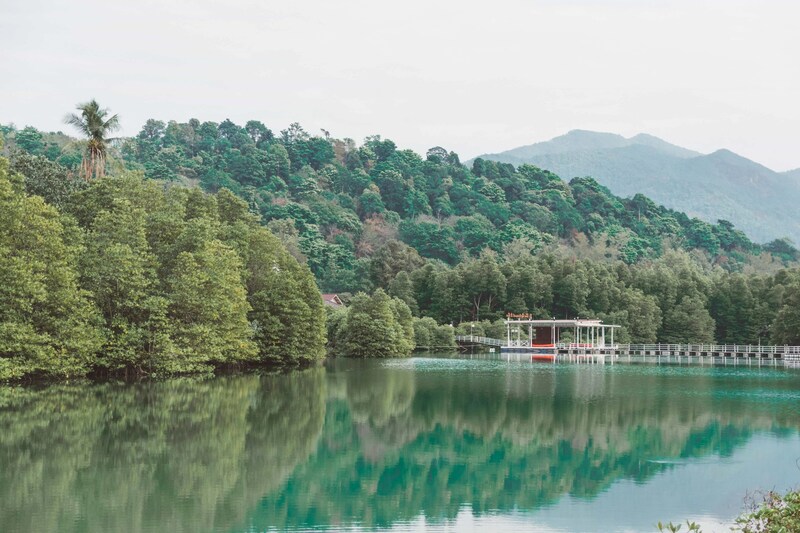 If you want to visit this famous destination during its driest and coldest months, November to February is the best time to visit Koh Chang. The weather is really good at this time but be warned of the number of tourists traveling with you as this is also Koh Chang’s peak season. 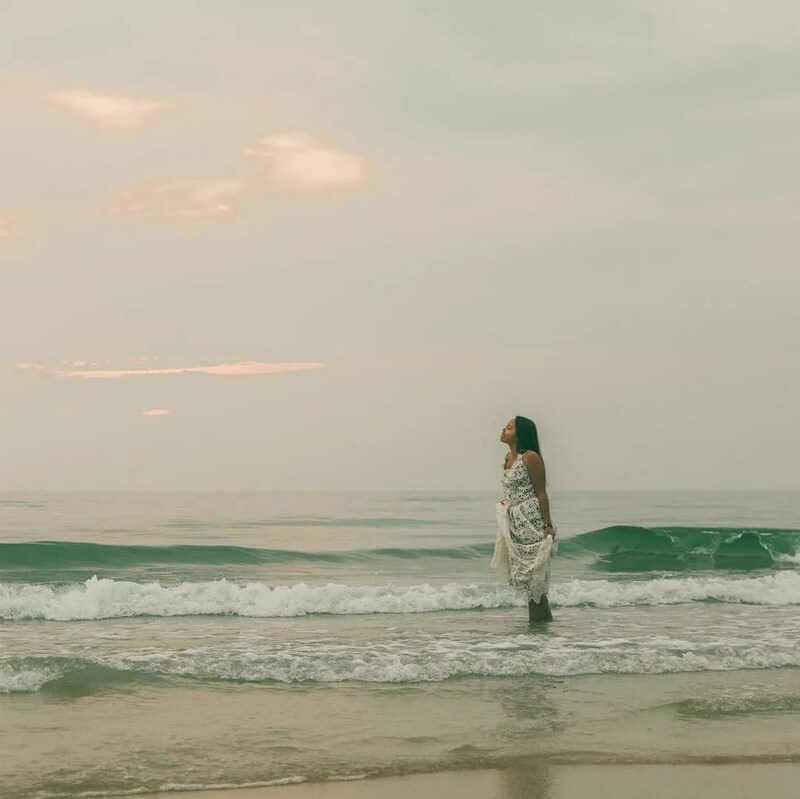 Click here to know more about the weather in Koh Chang! You can also rent a motorcycle in Koh Chang. The traffic situation is easy and the roads are well conserved. It will give you more flexibility. Prices are around 200 THB for an entire day. It’s much easier to track your expenses if you take note of the exchange rate of Koh Chang’s currency compared to your country. In Koh Chang, $1 USD = 33 THB, more or less. Click here to see the exact exchange rate of THB to your currency. Great news: There are a few ATMs around Koh Chang. Travel tip: While most banks charge 150 THB (or $4.60 USD) per withdrawal, the yellow colored ATMs of Bank of Ayudhya has removed this fee. If you can find one, it’s best to withdraw as much as you can using these ATMs. 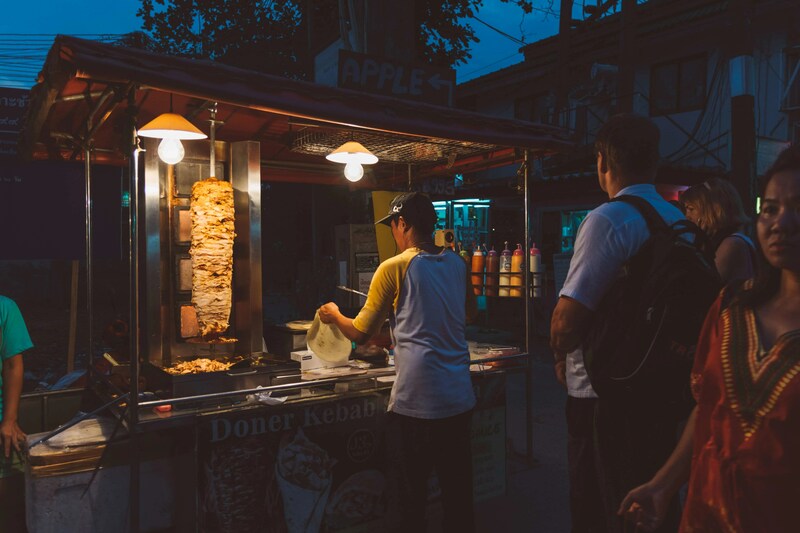 When visiting a foreign country, some travelers don’t really know what to expect when it comes to their daily expenses. Luckily, we got you covered. 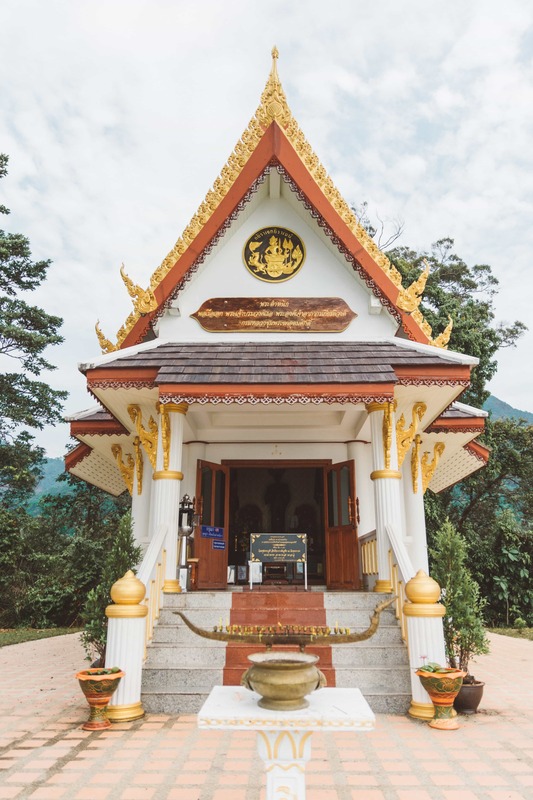 If you’re traveling to Koh Chang from a Western country, you’ll find that your euros, dollars and pounds go a long way in Thailand. 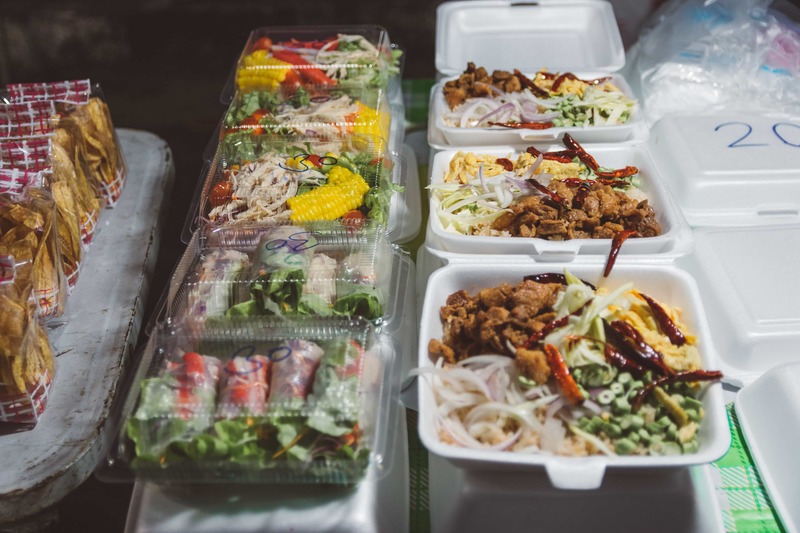 A modest yet decent meal can be bought for 50-120 THB, depending on which restaurant you choose. A bottle of beer in Koh Chang goes for 45-70 THB, which is only $1.40-2.15 USD. On average, food expenses for a day in Koh Chang for budget travelers cost 290 THB, or under $9 USD per person. Transportation around Koh Chang is affordable especially if you ride or the seongthaw. You can rent a motorbike for 250 THB and having a massage for similar price. 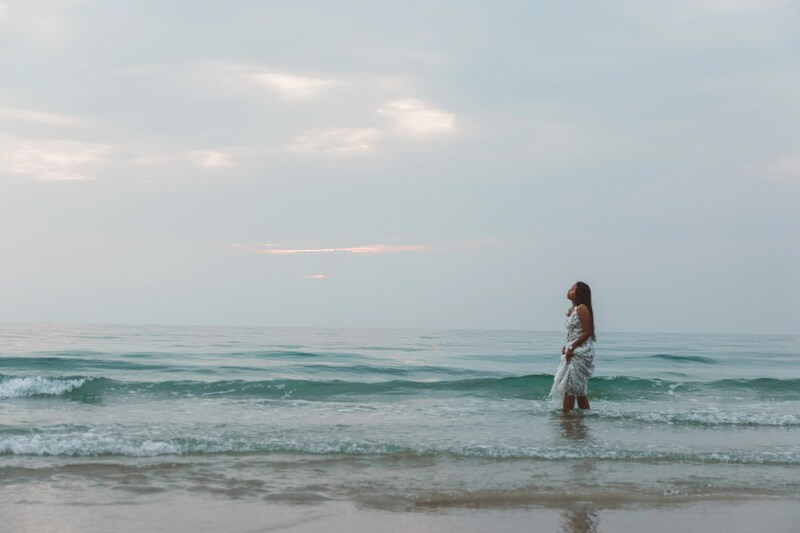 Many places to visit in Koh Chang do not require an entrance fee. 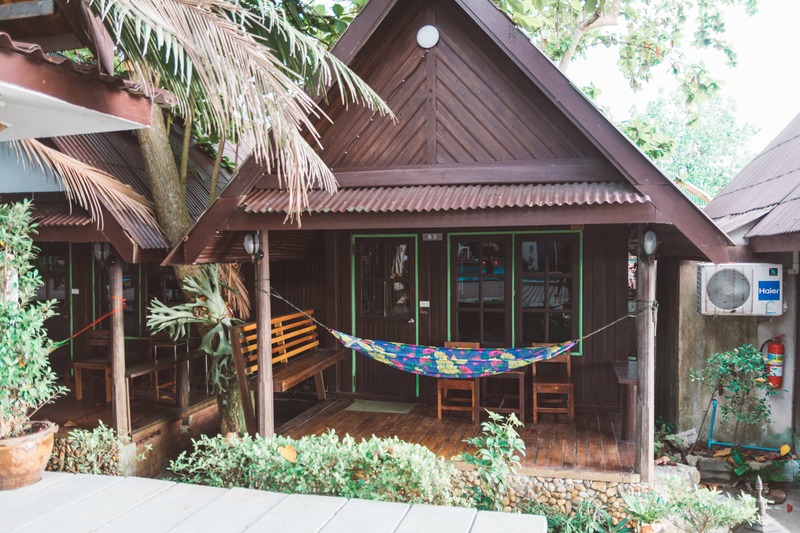 If you’re looking for budget hotels in Koh Chang, you can stay at a hostel, inn or guest house for as low as 400 THB. Mid-range hotels go for 400-1500 THB, more or less while luxurious rooms cost 1,500 THB (around $45 USD) on average. 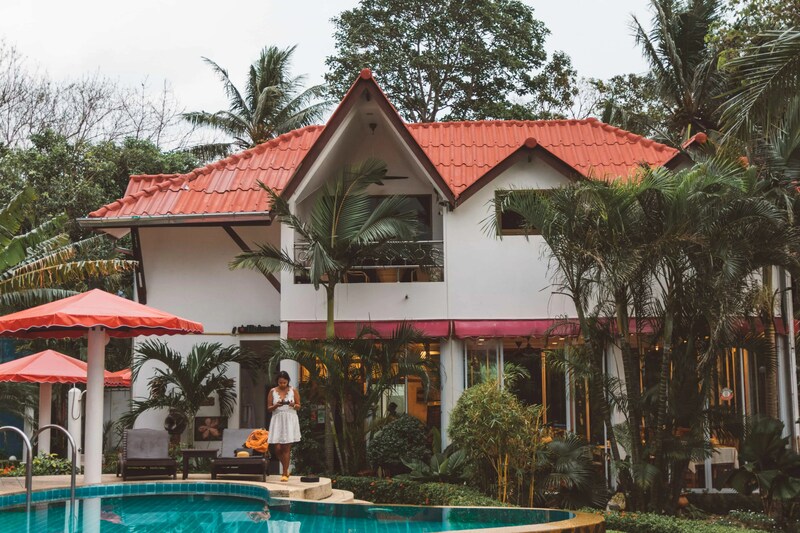 You can also try AirBnB in Koh Chang starting from 500 THB. CLICK HERE TO GET THE BEST DEALS WITH AGODA. Not far from White Sand Beach, there is a view point. It is easy accessible and there is a temple at the top. It looked like a nice place to fly the drone but we didn’t bring ours there! The beaches are great for walking around and swimming. These beaches aren´t so busy too. You can enjoy taking pictures but at sunset time, it will start becoming busy in the bars. We enjoyed a few sunsets from Top Resort, from Apple Beachfront, and our favorite one was at the end of White Sand Beach. We enjoyed the natural colors and the ambiance in those places. The place was very quiet and you can relax in a hammock or relax in the swing. Sunsets at White Beach are really beautiful. We couldn´t catch any sunrise since we aren´t morning persons ha! 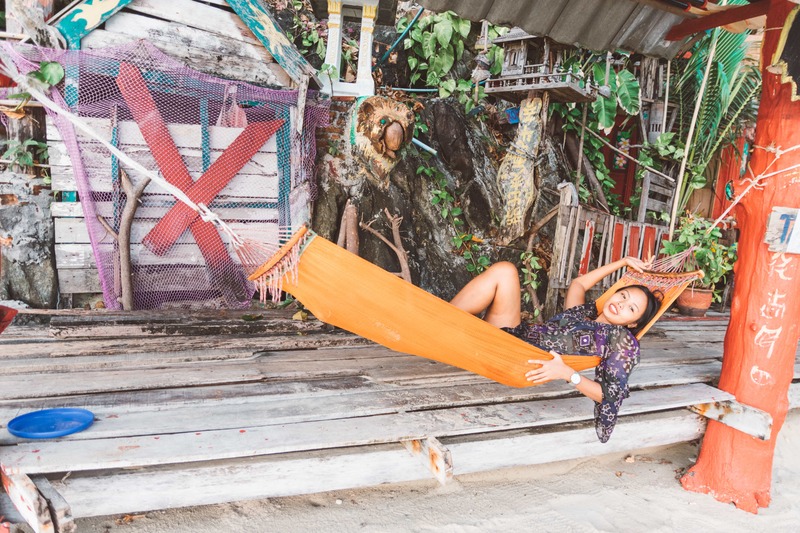 Hammock time while reading a book or taking pictures waiting for the sunset was one of the entertainment in Koh Chang. This island is very quiet and it´s perfect if you look one for relaxing. 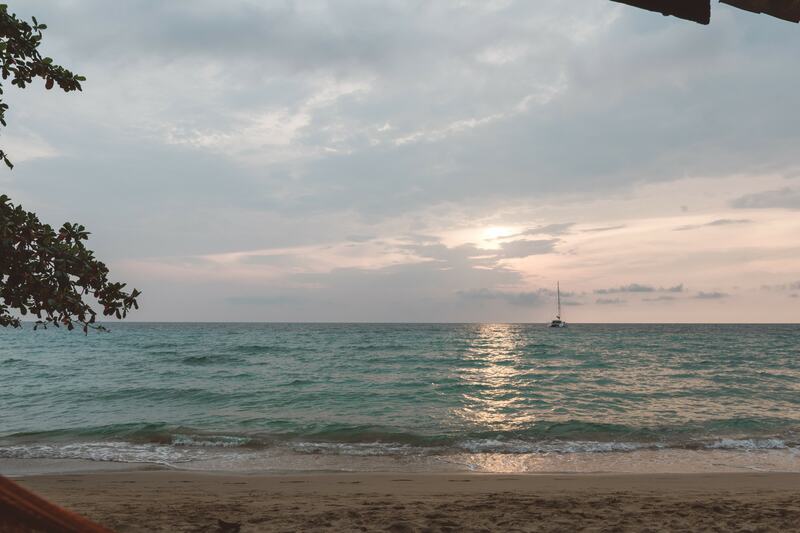 It´s totally different to Phuket, Koh Samui. The beach is really cool and there are a few places to have your beer, coconut, juice, cocktail or whatever drink you like. 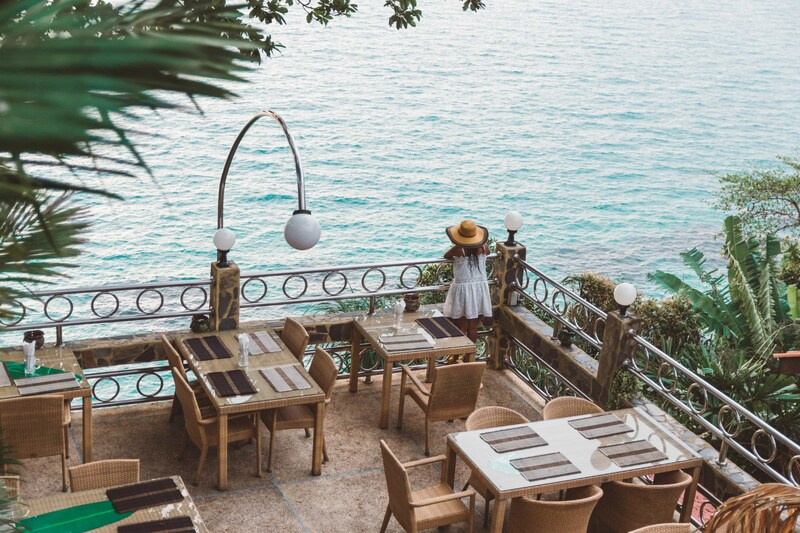 If you also prefer to eat, there are restaurants to have dinner in the beach. We loved having beer and walking around the beach after the sunset when the beach was very quiet. Beer and juices in the beach cost starting from $2-$3. There are local restaurants around White Sand beach. The dishes were delicious! Pad thai and fried rice were Rachel’s favorites. 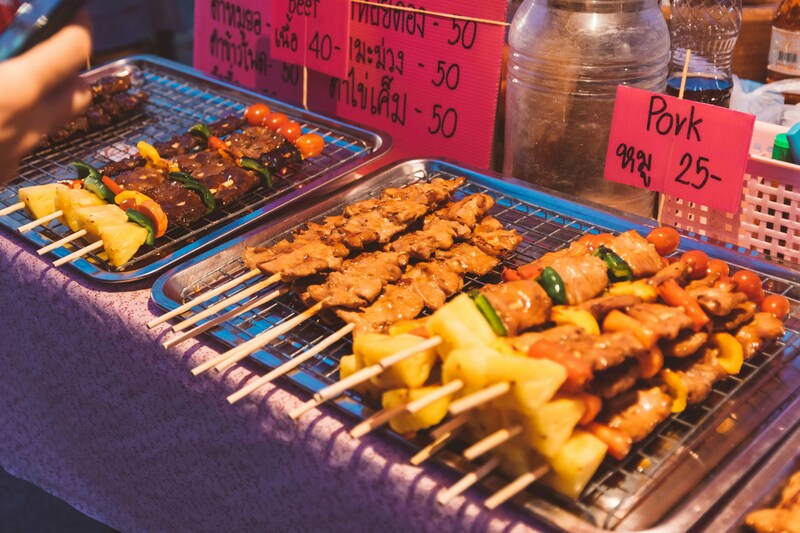 Prices are very affordable and you can find local dishes starting from 60 Baht ($2). Juices and beers are also $2. 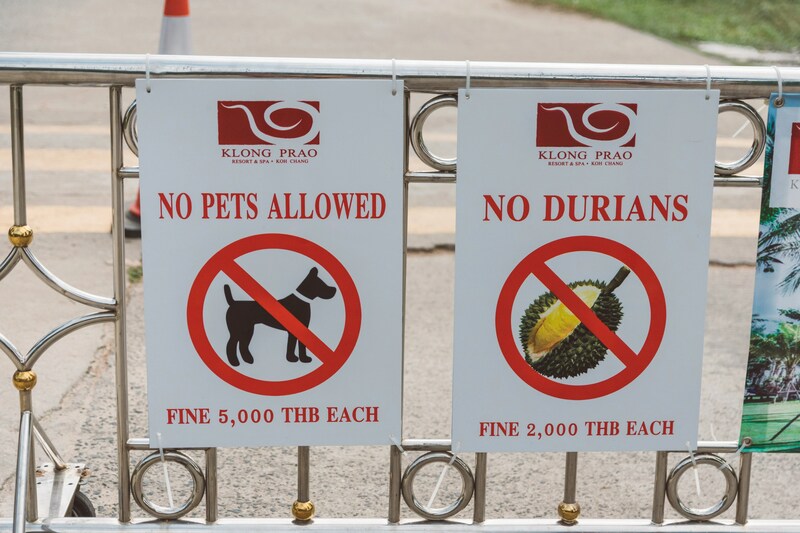 It was funny to us when we saw a sign about Durian being not allowed in buses or in beaches haha! The durian is a popular fruit in Thailand which is called King of the fruits and it´s famous because of its smell. We actually like the taste of the durian fruit. 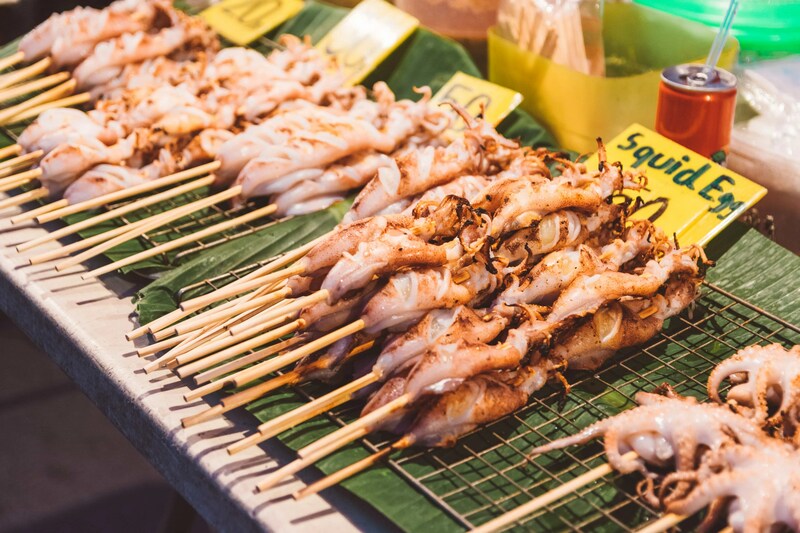 Our favorite in our Koh Chang travel guide was visiting the night market. 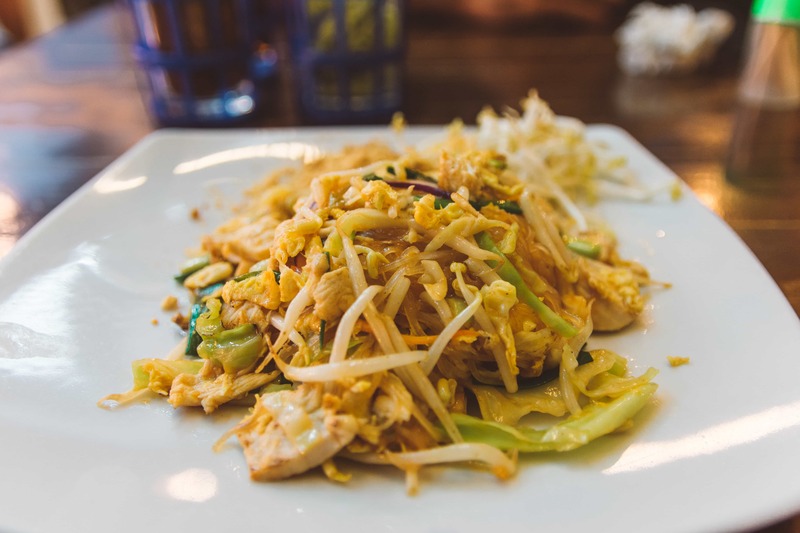 You can find barbecue, fried rice, pad thai, fruits, juices, salads, different desserts like pancakes and crepes, and many more here. You can takeaway the food or just eat in small tables in the market. Prices are even cheaper than the local restaurants’. Juices cost from 1 USD and dishes also starts from 1-2 USD. You can buy tasty barbecue as well and also apart from this, the rice. 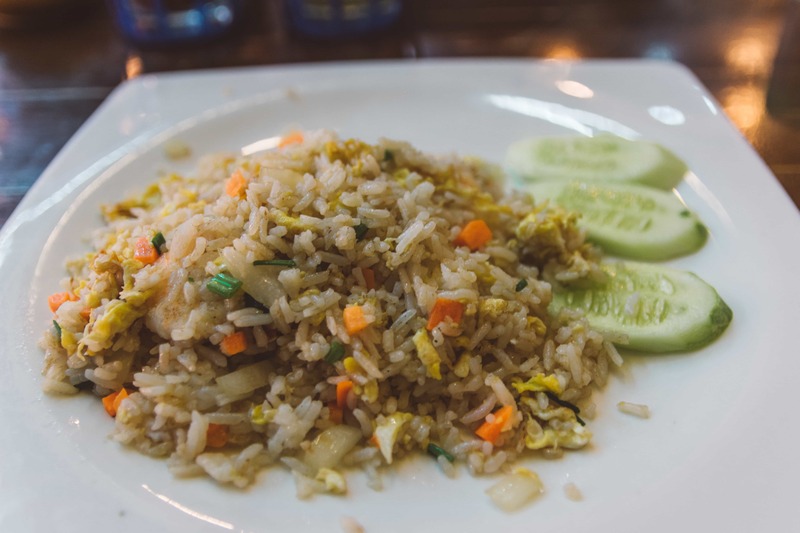 Enjoy a local dish mixed with rice or noodles. 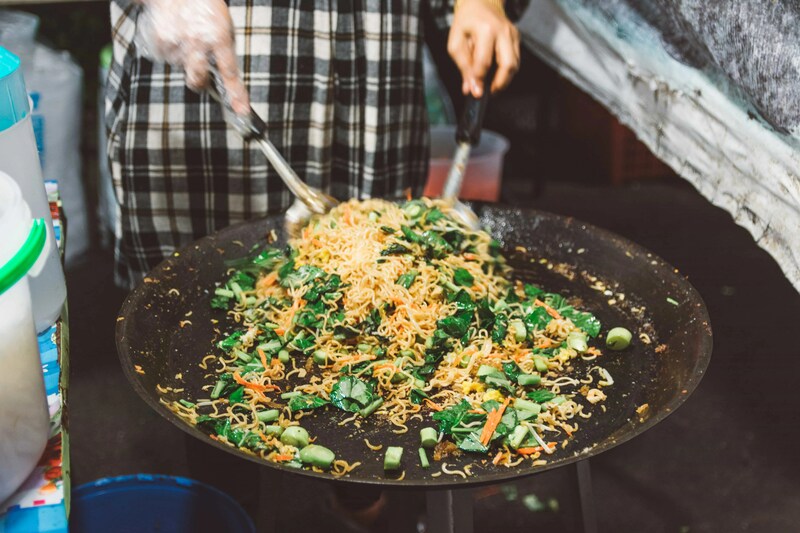 If you like Thai food like we do, you will get lost in the night market! And after exploring the night market, there are 7- Eleven stores everywhere if you are hungry. 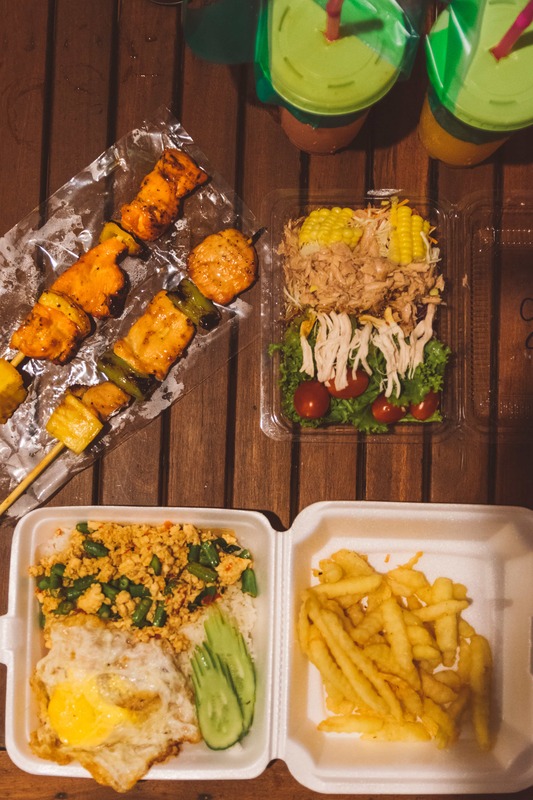 If you are in a hurry or in a budget, it is good place to takeaway breakfast or dinner, also to buy drinks! We spent a few days in Top Resort. The owners Bernard and Michael from Germany gave us the opportunity to feature them in our blog. The place with 12 Bungalows is really beautiful. The views are amazing and everything is very neat. We enjoyed talking to Michael and listening to his travel stories! 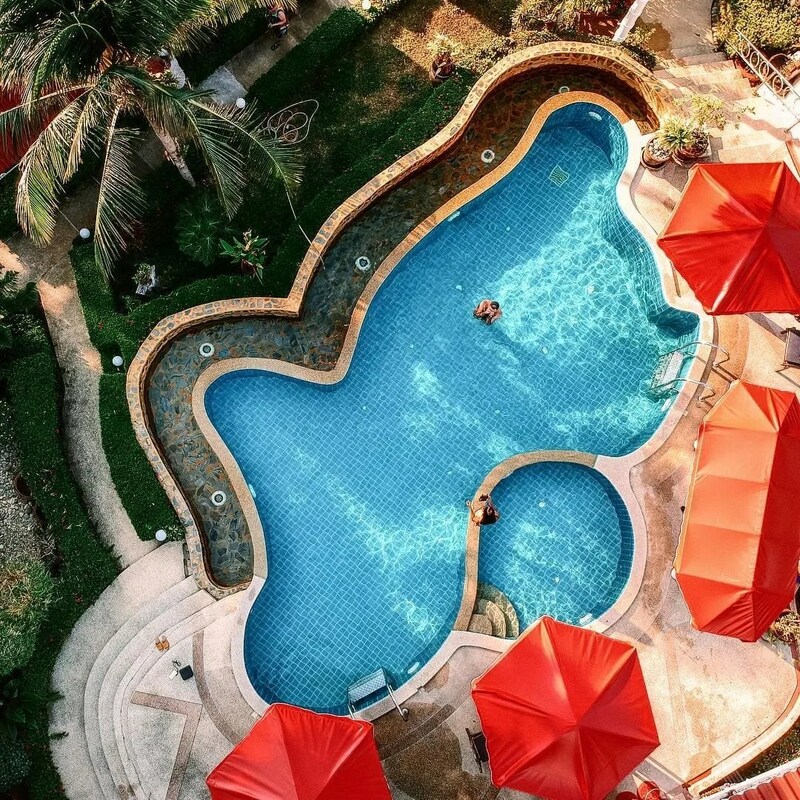 Top Resort is located 5-minute walking distance from White Sand Beach and two minutes away from local restaurants where you can eat delicious and affordable food. We were lucky with our room because we got the whole apartment for us, with a big fridge, living room and amazing views of the pool. The facilities are great as well, with a nice swimming pool and pool chairs everywhere. There is also a bar pool where you can listen to music at sunset time, and even a gym if you want to do sport like we did for a couple of days. We enjoyed flying the drone here each day since the place was great to take pictures. 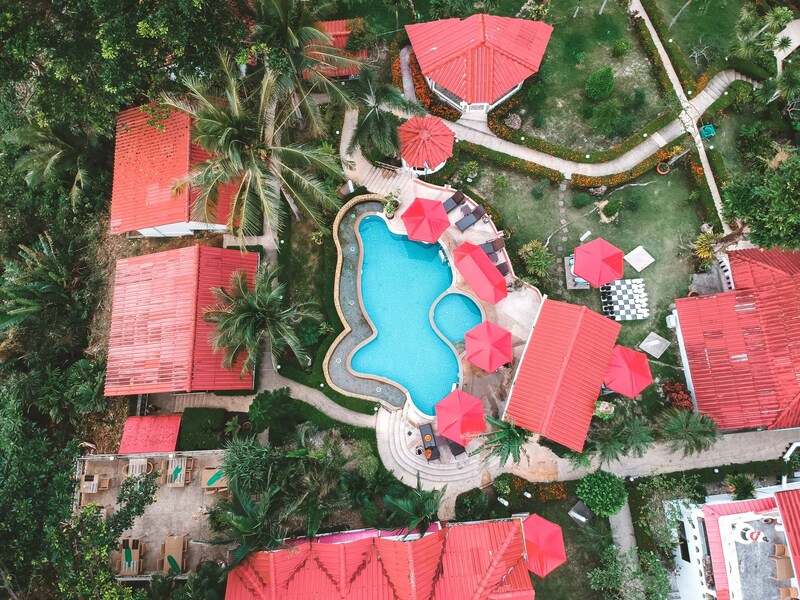 Apple Beachfront Resort is for travelers on a budget. It’s totally worth it for the price that you’ll pay. 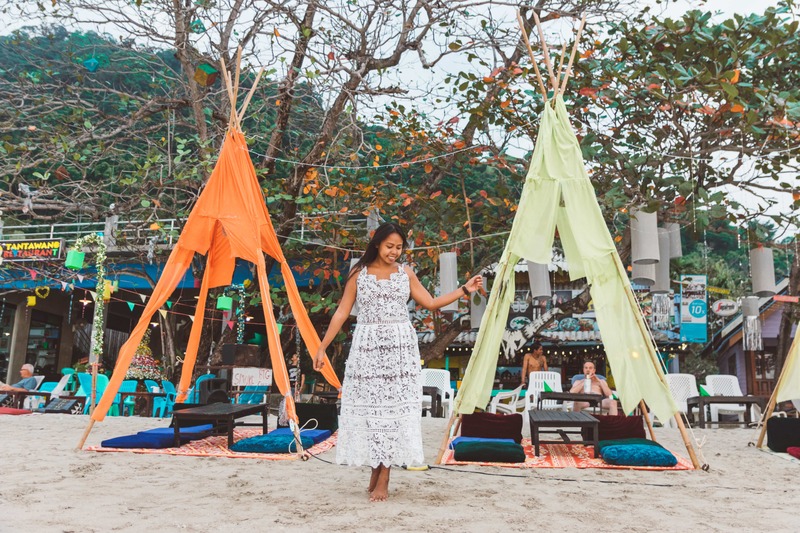 The location is great in White Sand Beach and it’s very close to the night market. We enjoyed our breakfast with a beautiful view in Apple Beachfront Resort. 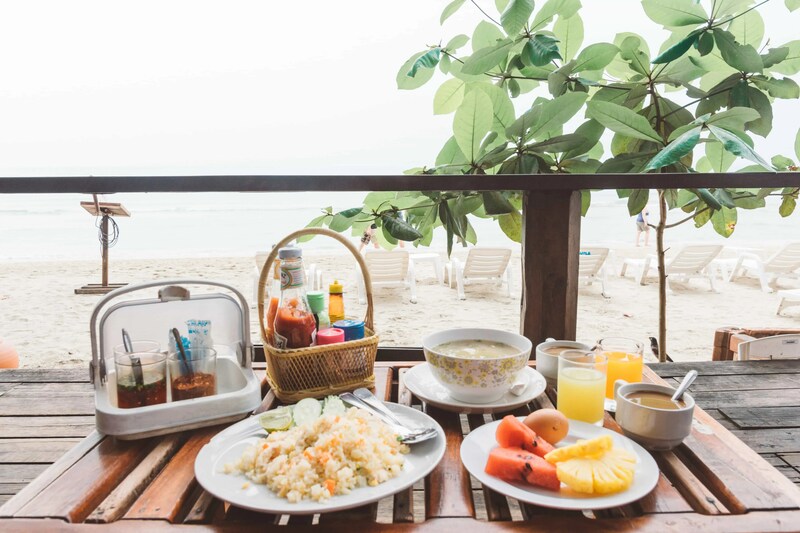 For breakfast, they serve both local and Western food choices, perfect to start the day. Apple Beachfront Resort is perfect for watching the sunset. You can sit down in the restaurant while having a beer or cocktail. It was so comfortable for us for getting everywhere on time. Our room had a table and a nice balcony with view to the pool. We enjoyed our street food from the market. 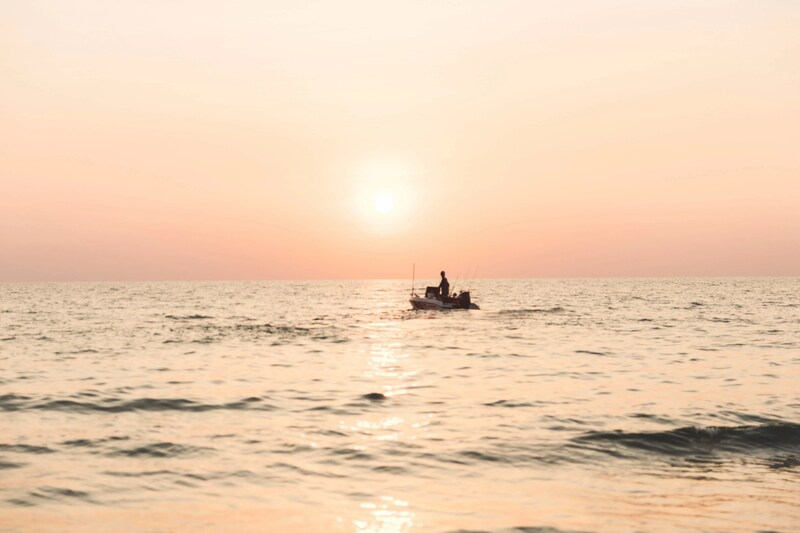 There are many cool things to do in Koh Chang, from renting a motorbike, bicycle, swimming, going for massage but obviously our favorite was visiting the night market and watching the sunset as you can see in the pictures above. From Koh Chang, we headed to Pattaya and Bangkok again. 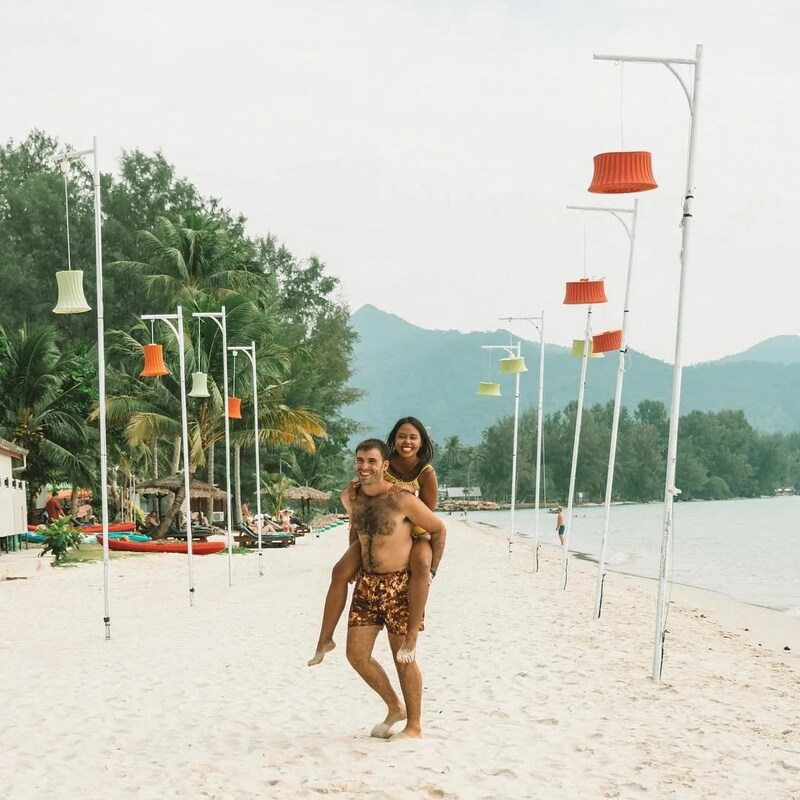 It was our first time in Koh Chang and we liked it so much. We stayed in nice beaches, nice hotels and we enjoyed local food. It´s a nice stop if you are coming from Bangkok. If you are planning to visit Bangkok, read our full post. It is especially useful if you will be staying at Khao San Road. 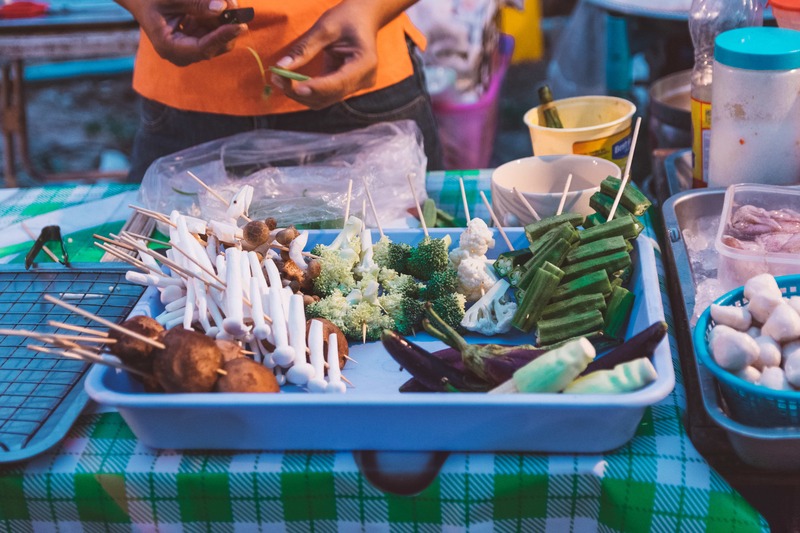 And read here if you want to read our full guide on travelling on a budget to Thailand. 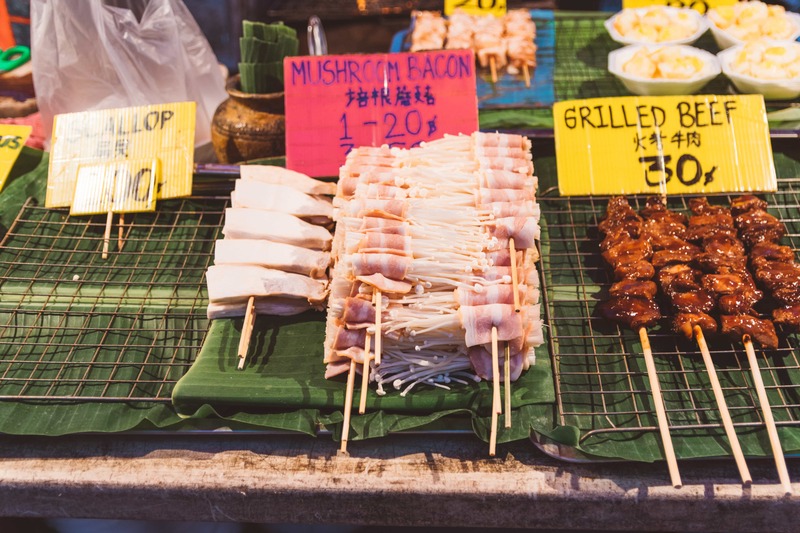 Let us know in the comments which food you would like to try when you go to Thailand or which one was your favorite food if you have ever been in Thailand. The main thing attracted me here is food. To be frank I am a foodie. Thank you for letting me to know the place. 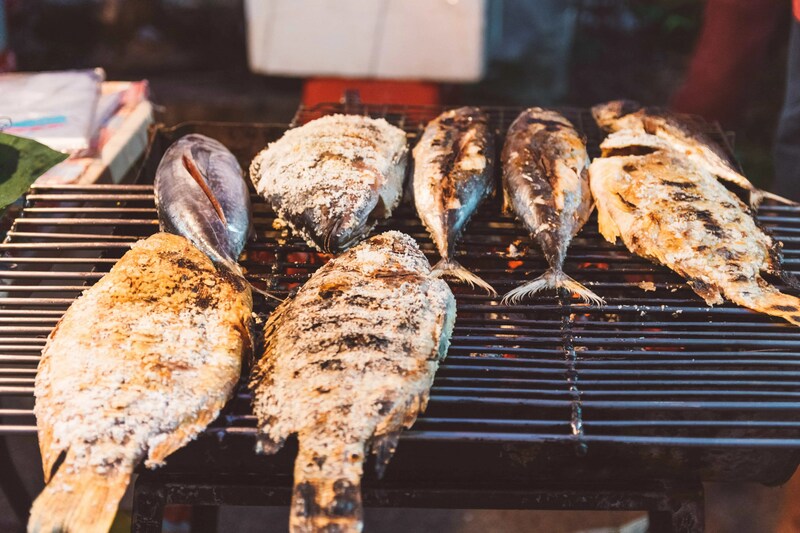 Food and relax in the beach 🙂 Koh Chang night market is great and very cheap prices too.